Today Rob and I made vegan meatballs. We'd been dreaming about them for weeks. Rob wanted to call them "Everything But the Kitchen Sink Meatballs" because they had so many ingredients—walnuts, oats, panko, tofu, nutritional yeast, sautéed mushrooms, and more. We baked them, then deep-fried them for good measure. Since we'd rolled them in cornstarch, they developed a nice golden, crunchy crust in the hot oil. We ate so many meatballs we had to stretch out on the floor in the sunroom after lunch. The cats walked around on our full stomachs and kneaded them and generally drew unwanted attention to them. "There's nothing like a cat kneading your stomach when it's full of meatballs," I groaned. "It's definitely not what you want," Rob agreed. "I guess we should just get up and do the dishes," I said. "Yep," Rob sighed. "Cats ruin everything." Sauté the onion and garlic in olive oil until onion is tender. Add the mushrooms and sauté until cooked. Put the onions, garlic, and mushrooms into a large bowl. Add the walnuts, fennel seeds, oregano, basil, salt, pepper, yeast, oats, panko, and liquid smoke. Break up the tofu with your fingers and add it to the bowl. Stir well to combine all the ingredients. Use an immersion blender to process the whole mixture until relatively smooth. Roll the mixture into small balls, about ¾ of an inch in diameter. Roll the balls in cornstarch to coat. Bake on a cookie sheet lined with parchment paper at 385 degrees F for 15 minutes. When the meatballs are done baking, deep fry them in hot oil. Drain on a paper towel. 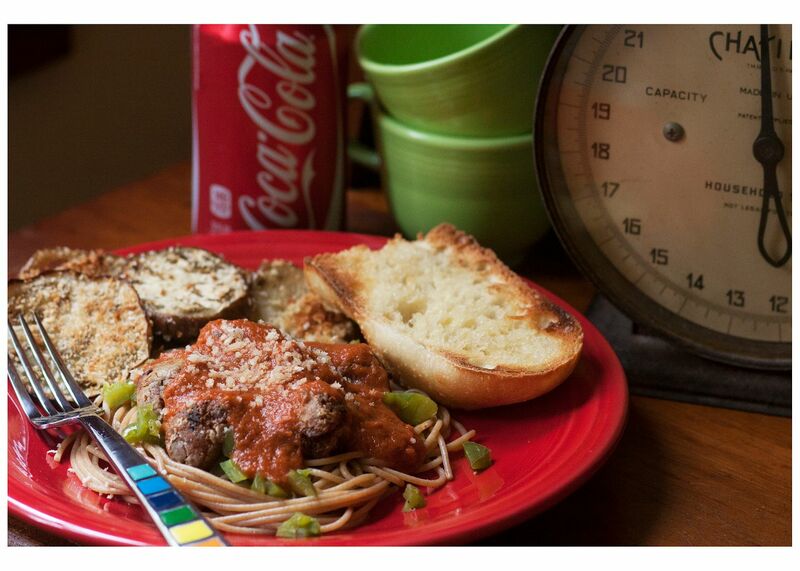 Serve over whole-wheat spaghetti noodles with marinara sauce.